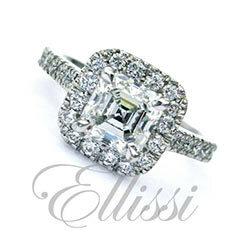 Every ring you see on the Ellissi website is a custom design we have made especially for a client. We make all our rings here in our studio workshop in Melbourne. 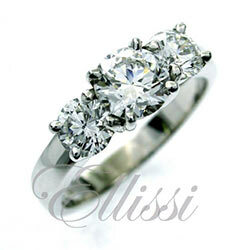 When you have your engagement ring custom made, we can tailor the diamond selection for the ring to suit your budget. This means that (in most cases), the same ring design can be made for a number of different price levels. The diamond grades we recommend range in colour from D to G. For clarity we recommend somewhere between SI1 – VS1, depending on the cut of the diamond, and particularly in the SI1 level, just how good the SI1 is. For more detailed information on diamond grades, please click on the following link: Deciding diamond grades . It is critical to have sound advice when you are choosing a diamond. Great diamond selection is really important to how the ring will look, but it is also very complex. We provide expert assistance to help you in your selection. Please don’t hesitate to Ask Ellissi if you have any questions. In addition to the GIA certification, all our diamond rings are accompanied with a full independent Valuation by a valuer registered with the National Council of Jewellery Valuers (NCJV). This NCJV document is an impartial assessment of the quality of the diamonds and of the ring. It provides you with a figure for the retail replacement value of the ring for insurance purposes. Your insurance company will require this valuation document before they will insure your ring. It is very important for your own peace of mind that you receive an independent expert third party assessment of the workmanship and quality of any ring that you buy. We are very happy to have our work independently assessed and verified, and provide this documentation to all our clients. It provides peace of mind not only to you, but us as well!